What Kingdom Hearts spin-off would you like to see? For nearly ten years, the Kingdom Hearts series has entertained fans of all ages on a variety of different game systems–though the games themselves usually stick to one game genre. While each game in the series has added something new to the story or has tweaked the gameplay, the series has only ever produced games that could be described as action RPGs. However, the Kingdom Hearts series is a strong character franchise combining the best known characters from Disney movies and Final Fantasy games, along with memorable original characters. Square Enix and Disney could easily create a full line of Kingdom Hearts games outside of the typical action RPG genre to reach a larger number of video game fans. Here, Kris Moore gives us just a few ways that Square Enix could capitalize on the popularity of the Kingdom Hearts series in other game genres. 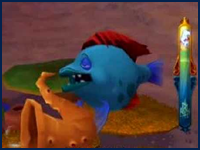 The Atlantica mini-games from Kingdom Hearts 2 didn't go well with most gamers. Still, the idea of dancing along to "Bare Necessities" and "Melodies of Life" is intriguing to say the least. Starting with something that has been touched on in the series already, the Little Mermaid rhythm mini-games in Kingdom Hearts 2 allowed Sora and his friends the chance to have some “finny fun” dancing, singing and playing instruments. The mini-game was fairly simple but a Kingdom Hearts music game could be successful as either a stand alone title or as an add-on to Rock Band or Guitar Hero. A Kingdom Hearts music game could give players the chance to play along to songs from both the Disney and Final Fantasy catalogues, not to mention Kingdom Hearts BGM and the title tracks by Utada Hikaru. Did someone say Keyblade-shaped guitar controller peripheral? With Birth by Sleep, the Kingdom Hearts series has finally begun to take advantage of racing mini-games. Could a full on racing game be in the series' future (or are we just dreaming)? The best kart games have a diverse selection of drivers, vehicles and race tracks to choose from, something the Kingdom Hearts series can provide plenty of. Imagine racing for the exit in the Cave of Wonders, tearing through the streets of Twilight Town and dodging enemy Light Cycles in Space Paranoids. Add in the ability to create custom go-karts using Gummi Blocks and you’ve got a certified crowd pleaser. Motion gaming is here to stay with every system now having the ability to give players a more immersive gaming experience. A Kingdom Hearts game based on motion controls would allow players to feel like Keyblade Masters and allow them to slash, swipe and bash their way to victory using their own body to control their weapon. In recent years several companies have gotten on board with multiplayer fighting games based on their franchises. From Nintendo’s Super Smash Bros franchise to Square Enix’s own Final Fantasy: Dissidia, it seems like whenever characters from multiple franchises get together, they just have to duke it out to see who’s the best. With a rich cast of Disney, Final Fantasy and original characters to pick from, Kingdom Hearts is ready-made for a game in the fighting genre. Choices in the Kingdom Hearts series: mash X or...mash X. 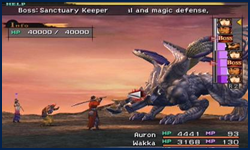 Maybe a turn-based system like the one found in the Final Fantasy's would give the series some needed strategy? While Kingdom Hearts is considered an action RPG, it bears little gameplay similarities to the turn-based games that Square Enix is famous for. A Kingdom Hearts game in the style of Final Fantasy or Chrono Trigger would give players the opportunity to plan every move and utilize every member of their team in a much more strategic way. Instead of setting up an AI system, you would actually be able to control Donald’s and Goofy’s actions, giving you the opportunity to make the best use of their individual skill sets. Not only that, a Final Fantasy-styled Kingdom Hearts game could even let you control your fourth party member at the same time or allow them to travel to the other worlds with you, adding a fresh layer to the gameplay and story itself. While the Gameboy Advance version of Kingdom Hearts: Chain of Memories may not have featured the lush 3D graphics of the PS2 re-release, it did have its own 2D charm that was reminiscent of old-school sidescrolling beat-em-ups. A Kingdom Hearts sidescroller that relied more on fighting mechanics and good old fashioned co-op action instead of using cards would make for a perfect downloadable game for any of the current game systems. The command board found in Birth by Sleep seemed to be popular with fans. Beating Cinderella at her own running game was definitely fun for me! Hopefully it'll return in Kingdom Hearts 3, with boards for every world found in the game. 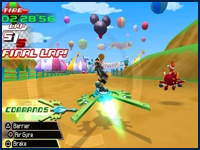 In Kingdom Hearts: Birth by Sleep, players had the opportunity to play board-game inspired Command Board that allowed them to gain power-ups and summon Disney characters. Each game in the series has also featured plenty of fun mini-games, from earning cash in Twilight Town to helping out Pooh and friends in the Hundred Acre Woods. Combine these two concepts and you’ve got a fun multiplayer party game ala Mario Party. 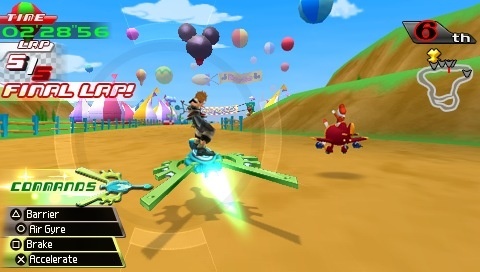 Each world in the Kingdom Hearts series could be its own board with its own unique mini-games for players to compete in. Online role-playing games allow players from around the world the chance to work together to complete goals and missions or go toe-to-toe to see who has the strongest character. Kingdom Hearts is practically set up for an online game with such a vast amount of different worlds to explore and characters to interact with. Players could create their own Keyblade masters, go on exciting quests and interact with one another in a giant Disney and Final Fantasy inspired environment. Kingdom Hearts: 358/2 Days introduced the idea of a multiplayer gaming experience, but a Kingdom Hearts Online RPG would be the natural evolution of that concept, giving players a virtual Kingdom Hearts world to play in 24-hours a day. Overall, the Kingdom Hearts series has proven itself to be a strong franchise in the video game industry with a large fan base and plenty of new games on the horizon. No one can say for sure what Square Enix may come up with next, but it’s likely that we may see a Kingdom Hearts game that breaks out of the action RPG format in the near future. So what are your ideas for the Kingdom Hearts series? Would you like the series to try out a turn-based format for once? Maybe branch off into a Dissidia or Mario Karts title? Did Kris Moore have some good ideas you hadn’t thought of? Any ideas you didn’t see here? The sky’s the limit.